Mind Maps can be used to structure an entire organisation, to act as a stabilising vision for the organisation, and to explain the organisation to others. The Mind Map on page 262 is by Mr Jan Pieter H. Six, Vice-President of Interpolis, a Dutch insurance company. In both structuring and explaining his organisation to others, Six considered: organisation; roots; co-operation; acquisitions; sales; and reorganisation. The organisational development will be looked upon from two points of view: level of command (top, division, branch or department) and dominance in the organisational structure of product (life/non-life), customer (farmers/ individuals/business) or region. Interpolis is rooted in the Catholic agricultural cooperatives. The farmers are organised into four Catholic farmers' unions, one in each diocese. These unions have created their own cooperative institutions like banks, a pension fund and insurance companies, originally mutual fire insurance companies. In 1969 the pension fund and the four insurance companies merged into Interpolis. Four years later the five companies were concentrated in Tilburg. The organisational structure was heavily determined by product. In 1972, Interpolis acquired specialist hail insurer Hagelunie, followed in 1985 by general insurer De Twaalf Gewesten. Both companies have a joint office called Triadome. Specialist cattle insurer Paarden-Vee-Unie is Interpolis' latest acquisition. Interpolis sells its products through intermediaries. Three distribution channels can be distinguished: the 800+ Rabobanks, the 60 LLTB-agents and 100+ NEVAT-agents. Until recent years the sales staff consisted of a marketing department and five regional sales organisations, each with its general and specialist inspectors. Reorganisation brought many changes between 1987 and 1989. In 1987 the specialist inspectors were detached from Sales, transformed into several specialist corps and added to three branches. 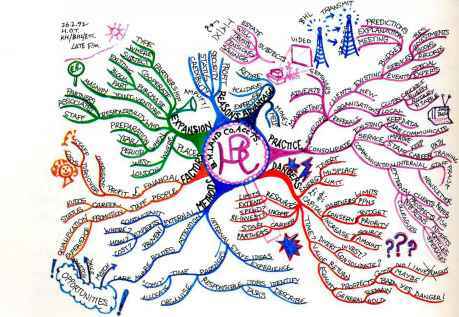 The Mind Map is a major tool in marketing. Temple Marketing in Britain uses a 'Marketing Matrix Mind Map' (MMMM) to plan the marketing needs of every customer. The Mind Map on page 263 is by Nigel Temple, President and Chief Executive Officer of Temple Marketing, and forms the basis of their marketing plan with every client. Completed EDS 'Championship' Mind Map (seepages 266-7). Electronic Data Systems (EDS), the information systems conglomerate, makes the teaching of Mental Literacy among its employees a prime corporate goal. One main feature of this campaign is the development of leadership capabilities. To accomplish this it was essential to establish a complete understanding of what individual project goals were and to establish the purpose of the leader or 'champion' for the many and various projects. Mind Map by Thomas H. Schaper of the Association International Management in Germany, on incorporating effective use of time management in life (see below). 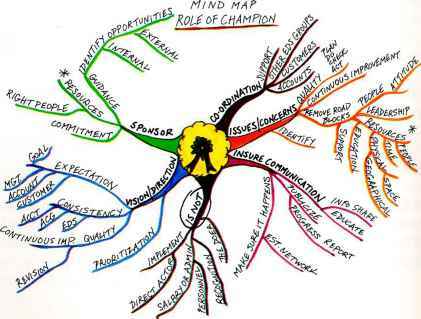 An example of a completed leadership/champion Mind Map can be seen opposite. 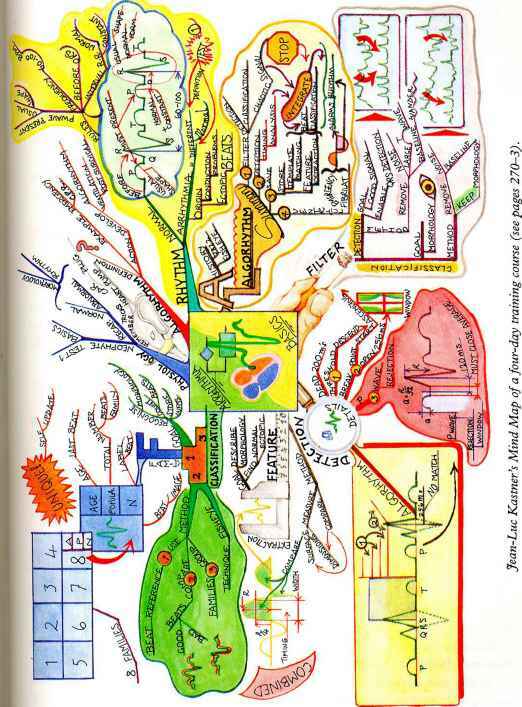 As discussed in Chapter 20 the Mind Map is especially useful for time management. 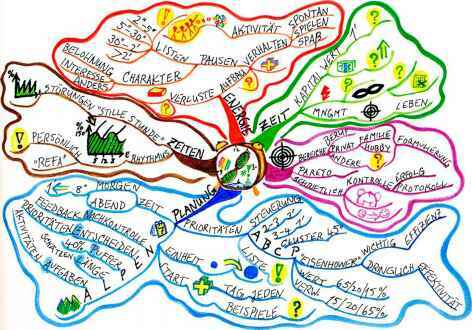 The Mind Map above was done by Thomas H. Schaper of the Association International Management in Góttingen, Germany. 1Championship' Mind Map used by Jim Messerschmitt and Tony Messina, Director of Leadership Project at EDS. This is the first stage (see page 267). focuses on target areas: the nature of planning (incorporating a German mnemonic 'ALPEN' for the prime steps in personal time management); the nature of biological rhythms; and the maximisation of energy by the appropriate management of one's time. As often happens with Mind Maps, Schaper has found his to serve multiple purposes. It helped him streamline his own time and self-management and enabled him to guide his colleagues. Mind Maps became a focal point of interest, making him an expert in the field and someone who others approached for guidance. Mind Maps are becoming an increasingly valuable currency in the accounting field. Award-winning students in the English Institute of Chartered Accountants use them to prepare for their examinations, tax advisers in such prestigious companies as Price Waterhouse use them for solving problems and advising clients, and as can be seen from the Mind Map by Brian Lee (page 270), founding partnerofB.H.Lee&Company, Accountants, AuditorsandTaxationConsultants, Mind Maps are being used in the development and expansion of practices. 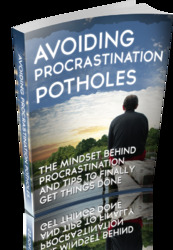 The major danger is the overuse of resources by over-committing and over-extending. It is essential to consider what dangers might exist to the career structures of Partners and staff when expanding, what pressures would be felt on income, spending and reinvestment plans and how much energy might be misplaced, diverted or prove to be too limited. Not only do we need to develop, we need to consolidate. There is no point in obtaining new customers if at the same time you lose old ones. It is also important to realise that development applies to staff as well as clients. Development can be achieved by marketing, advertising, referrals and in particular, from existing clients. This can all be aided by holding budget meetings, emphasising other services and seminars and holding special events. Expansion needs to be defined. It revolves around a number of initial questions. Who is expanding: Partners, Associates, customers, staff? When is the expansion to take place? Over what period? Where are you aiming to expand, i.e. the place, catchment area? Are you intending to do so by joint venture, purchasing other business, co-operating with others or forming other partnerships? Also, how do you identify opportunities in each of those areas and what might persuade somebody to join in such an expansion plan, i.e. them being able to retire, take holidays, have on-hand help, expand a business empire, or lessen responsibility and at the same time actually make more money! What are the costs involved in such expansion: capital costs, resource costs and costs against normal rate of income? Mind Map by B. H. Lee of B. H. Lee & Company, Accountants on the development, dangers, and expansion of a business practice (see pages 268-9). 6 Multiple Uses-in-One f Jean-Luc Kastner, a Senior Manager in Hewlett Packard Medical Products Group Europe, was confronted with a problem. His company manufactures a computer system that is able to monitor and analyse the rhythms of the heart, detecting malfunctions early enough to alert the attending physician in order to take proper corrective actions. They run a four-day 'Cardiac Arrhythmia Training Course' taught by specialised trainers. One day the staff member in charge of this application training reported ill and was going to be absent for two months. Kastner, as 'the boss' and as the only person with enough background information to even consider running the course, was obliged to fill in for his employee. The emergency required that he organise and supplement his existing knowledge and teach the course. This training course seemed to be an ideal case for testing teaching by Mind Maps on a very difficult subject. a) To have all students pass successfully the graduation tests at the end of the 4 days. b) To have all students build their own reference manuals. c) To not use overhead projections (unless a copy of a medical record). d) To improve the recall factor after one month by 100% (it was often well below 40%). e) To have both teacher and students enjoy the experience. The training was structured using the Master Mind Map as a (road map\ Each branch represented one major topic, and for each branch I developed a detailed Mind Map designed in order to be reproduced on a flip chart. 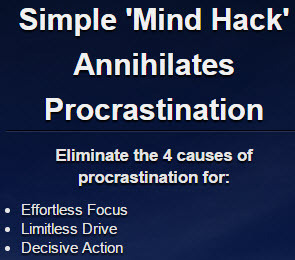 Every second hour a major break was taken. At the beginning of the course the trainees were instructed to leave all personal writing materials outside the room. They were confronted with tables that had only A3 blank sheets of paper and a wide variety of coloured pens. The trainees were introduced to Mind Maps. For the 4 days to come they were requested to copy from the flip chart whatever Mind Map notes the teacher made. The course was organised in sections of 40 minutes, with 10 minute breaks. During these breaks trainees had access to computer-aided training tools that simulated patient electro-cardiograms (ECGs). They tested their knowledge as the course progressed. When one branch of the Master Mind Map was completed the trainees were asked to develop their own Master Mind Maps. For this purpose a gigantic sheet of paper was posted on the wall and the group as a whole participated in building the Master Mind Map [see page 271]. At the end of the day, the students were asked to copy the Master Mind Map on their own documents and to review and file the documents of the day. On the next morning one of the students reviewed the Master Mind Map of the previous day with the group. The next activity then started. Mind Map and discussed it in detail. The final 2-hour examination (required for graduation) was then taken. We have run the course based on the outline described. (Twelve students, from England, France, Germany, Italy and Ireland attended.) All twelve graduated with 18 out of 20 - the best grade ever. I conducted an informal survey after one month and the recall factor was well above 70%. In fact out of 10 questions asked, they could answer, on average, nine of them! Course feedback was excellent, the students judged the method to be more successful, more useful and more fun than the old slide-show-based course. Some students even commented that the pace of the Mind Map-based course was much better adapted to trainees whose English knowledge was not perfect. This demonstrates the success of Mind Map-based training. The Mind Map-based course has been run in the meantime 4 times by different trainers with comparable results. Mind Map teaching is definitely the teaching tool of the 90s. How to use radiant thinking? How to do mind map for individual?